It’s a hunch, but I would be willing to bet that you could persuade the most ardent veggie haters to try this cauliflower recipe. Roasting cauliflower magically transforms the snow white crucifer with cabbage-y notes into a tender yet crispy, caramelized treat, coaxing out its natural sweetness and nuttiness. Simple seasonings, such as paprika, salt and pepper gently enhance the flavor. You can serve it simply like that, or go the full Monty and toss it with chilies, lemon and mint. Sambal Olek is a Southeast Asian chili sauce. It’s Middle Eastern cousin, Harissa, may be substituted. Serves 4. Preheat the oven to 400°F. Slice the cauliflower, top to bottom into 3/4-inch slices. (Slicing the cauliflower will provide flat sides which will brown easily when roasting). Cut away the thick stems, and gently break the florets apart into large bite-sized pieces. Place in a large bowl. Add the garlic, 2 tablespoons olive oil, paprika, salt and pepper. Gently toss to coat, then spread onto a rimmed baking sheet. Some of the florets will break into small pieces, but that’s ok – the little bits will get nice and brown while roasting. Roast on the bottom rack in the oven until the cauliflower turns brown on the bottom, about 20 minutes. Transfer the pan to the top third of the oven and continue to roast until golden brown on top and tender, about 20 minutes. Transfer to a serving platter. Drizzle with extra olive oil. 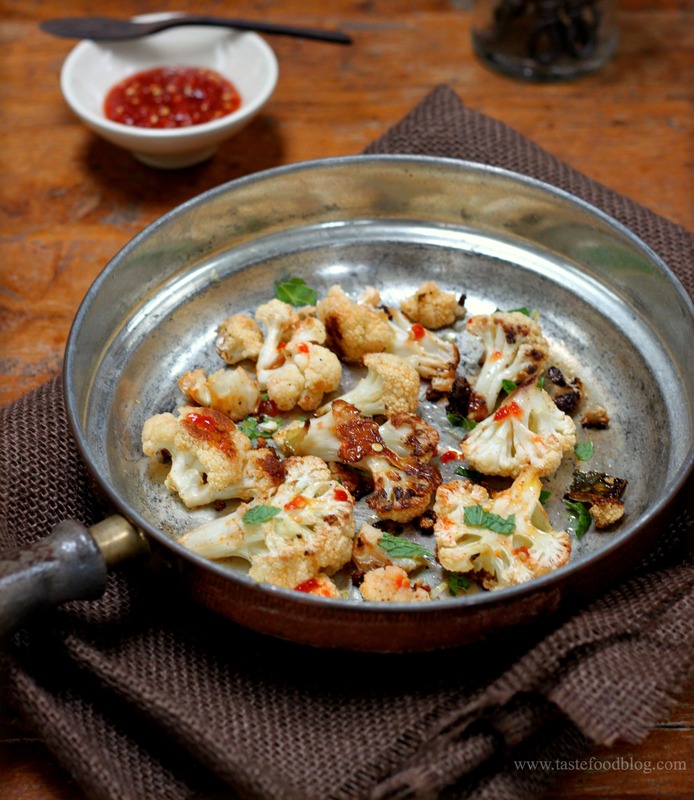 Drop small spoonfuls of sambal olek over the cauliflower and garnish with lemon zest and mint. Serve warm or at room temperature with extra chile sauce on the side. You’re so sweet – thank you. Tasty and healthy! Roasted cauliflower florets taste so good. I’m a roasted cauliflower fan and that looks fresh, full flavored and lovely colours too! Cauliflower is my husband’s favorite vegetable so we eat a ton of it, especially in colder weather. Love your flavor combos here. This sounds so amazing! I need to spice up my cauliflower recipes! Roasted cauliflower is a gift – it is just so good! I feel that cauliflower is underappreciated and thus underutilized. LOVE this recipe! I’m in love with roasted cauliflower, broccoli, onions, carrots, fennel, really anything roasted. I’m really excited to try this recipe. Cauliflower is one of my favorites, and especially roasted. Sambal olek is a completely new thing to me! I’m sure I’d love it since it’s spicy. I’ll have to look for it! This looks fabulous, I will have to try it! I’m a full monty kinda guy, but you knew that, yes? Sambal is an all-time fave!